“Hail, full of grace, the Lord is with you” ( Lk 1:28). How many persons have greeted Mary with these happy words, pronounced for the first time at Nazareth? In how many languages and writings of the great human family? Not long after her betrothal, Mary received an epoch-making revelation while she was at prayer in her home. The angel Gabriel appeared to her, probably in visible form, as he had to Zachery in the Holy Place of the Temple (Lk. 1:11). He greeted her with the words: “Hail, full of grace, the Lord is with thee, blessed art thou among women” (Lk. 1:28). Some think that the Greek word for “hail” (chaire) represents the salutation Shalom, meaning “peace,” “prosperity,” in common use among the Jews. But the literal sense is chaire, “rejoice thou,” may be intended. For this exhortation is repeatedly found in the Prophets and rendered chaire in the Septuagint (Zeph 3:14-17; Joel 2:21’ Zach 9:9; Lam 4:21). In this supposition the very first word uttered by the angel suggests that he is a herald of spiritual happiness. “Full of Grace” translates kecharitōmĕnē the perfect passive participle of charitŏō. It denotes one who has been and still is the object of divine benevolence, one who has been favored and continues to be favored by God, one who has been granted supernatural grace and remains in this state. Verbs ending in ŏō, such as haimatŏō (turn into blood), thaumatŏō (fill with wonder), spodŏōmai (burn to ashes) frequently express the full intensity of the action. Kecharitomene denotes continuance of a completed action. Hence kecharitōmĕnē has been suitably translated as “full of grace”, by the Vulgate and the Peshitto (The principal Syriac version of the Bible). This rendering expresses the conviction of the Church that the divine favor was fully bestowed on Mary, in the sense that she was ever immune from the lease stain of sin and that she abounded in graces of the supernatural life and in all the gifts and fruits of the Holy Spirit which flow from that life. Mary was much perturbed by this salutation, far more than Zachary had been by the apparition of the angel in the Holy Place of the Temple. The cause of her perturbation was not the eulogistic character of Gabriel’s greeting, which her profound humility must have born with equanimity, but the intimation conveyed by his words that she was selected for some great task the difficulty of which she viewed with apprehension. While she was pondering on the possible import of the message, the angel reassured her, addressing her familiarly by her name, bidding her not to fear and reaffirming the fact that she had found favor in God’s sight (Lk 1:30). Then he recounted the nature of the grace conferred upon her: “And behold, thou shalt conceive in thy womb and give birth to a Son, and thou shall call his name Jesus. He shall be great and shall be called the Son of the Most High. And the Lord God will give him the throne of David, his father. And he shall reign over the house of Jacob throughout the ages and his kingdom shall have no end” ( Lk 1:30-31). Throughout her conversation with the angel, Mary displayed admirable virtues; simplicity, prudence, wisdom. When Gabriel finished speaking, Mary was confronted by the supreme test of her faith, obedience, and humility. Would she assent to the will of the Triune God, who did not wish to save the world without Mary, to become the Mother of the Divine Word in His human nature? Would she satisfy the yearnings of mankind for salvation, the hope of the angels for the redemption of man? Her answer to Gabriel was: “Behold the handmaid of the Lord! Be it done to me according to thy word” (Lk 1:38). This shows that her faith in the angel’s revelation was complete and unreserved, that her consent to be the Mother of God was not passive but active, unforced, absolutely free, that her humility was deep and her obedience wholehearted. At this moment the Incarnation took place, and the angel departed. A precise translation of kecharitōmĕnē is admittedly difficult. “Highly favored” is representative on most of the English phrases used by Protestant exegetes (students of the Bible). The word does not refer to physical appearance but signifies a singular grace given to the mother of the Messiah. Most admit that this passage signifies that God has endowed Mary with some outstanding prerogatives of character. The exceptions to this group consider “the grace” to be the privilege of her Messianic motherhood. Yet, in their view, even if this is a grace of character, it must have resided in Mary in a transitory way, for it does not remain with Christ’s mother to help conquer either her impatience at Cana or her infidelity as recorded in Mark’s third chapter (3:20-21, 31-35). Mary’s fiat expresses her humility; it expresses her free acceptance of the will of God for her place in the divine plan. But Protestant exegetes are wary of going further and trying to discern in Mary’s words the creature calling into existence by her consent God’s Redemption. The fiat becomes primarily a literary figure which concludes a passage. The Protestant, owing to a distrust of the idea that the creature is elevated in being and act by grace, approaches with great caution the possibility of Mary’s participating intimately in redemption and salvation through her free but divinely aided consent. The Catholic Church has pronounced definitively on very few texts. But the following should offer us an idea of how the Catholic approach finds Mary in the gospels. Catholic exegesis shows how much lies in the words of the gospels, and at the same time it asks us to look at Mary in the context of her life and faith. Was Mary herself a source for St. Luke’s writings? His descriptions of private incidents such as the Annunciation, and his understanding of how Mary pondered the events of Christ’s birth, lead many to think so. The chapters of Luke dealing with Mary and with the Incarnation posses a unique (possibly Hebraic) style. This tradition may have come ultimately from Mary. Contemporary Catholic exegesis does not expect to find a detailed speculative theology openly contained in the words of Luke. For instance, it is not indicated that Mary’s understanding of the unique character of Jesus was glimpsed by her in the same way as it was understood later in her life, or as it was understood by the Church at the time Luke was writing. As we will see, the words of the angel were primarily a suitable vehicle for introducing a young Jewish women to a transcendent Messiah who was to be her son. Mary’s mind comprehended slowly the ideas with which we are familiar. Current exegesis sees a wealth of Old Testament allusions and theological commentary by the early Christian community present in St. Luke. The first two chapters of Luke are a pattern of biblical themes. Over seventy Old Testament references can be found in these chapters. In St. Luke’s infancy narrative we have two parallel stories: the coming of the Baptist and the incarnation of Jesus. There are two annunciations by Gabriel, the union of the mothers at the visitation, two births, two circumcisions, two important names. The incidents described by Luke form a series of pictures, ordered, balanced, presenting a total view of the coming of Jesus. Another idea, that of Mary as the representative of Israel fulfilled in bringing forth the Messiah, is found in the opening words of the angelic message. Shout for Gladness, O Israel. …a mighty Savior (Zephaniah 3:18-20). Catholic exegetes see this passage as a basic inspiration behind the greeting to Mary. The same greeting id given to Mary; she is not only Sion but full of grace. Yahweh is within her in a unique way; he has come to his nation of Israel as Jesus who will save. In the Old Testament the theological relationship was between Israel (personified in a feminine way) and Yahweh; now it is between Mary and God. Mary becomes all that is great and beneficial to man in the chosen race. 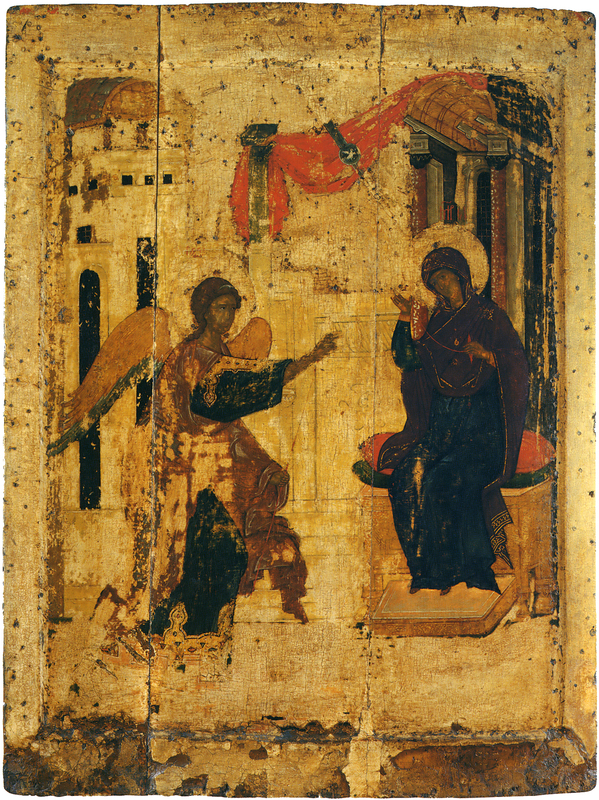 Just as biblical figures had unique names designating their individuality and mission, so Mary is addressed by her “scriptural name—Full of Grace. This phrase personifies the Mother of the Redeemer in the divine economy. Some recent Catholic exegetes have seen in this phrase not a compliment to Mary for the way she has qualified for her mission but rather her privileged activity in the salvation of man. Without reacting from this point of view to one which says the entire Catholic theology of sanctifying grace is unfolded in this title, Catholic exegetes still consider it as making Mary the special personification of divine favor. Her involvement with the coming Messiah somehow flows from her fullness of divine favor, from her preparedness to respond to what God will ask. Just as Israel has been prepared to give the world its savior, so has Mary, the apotheosis of Israel, been prepared in her spirit by God for the Incarnation. It is Luke, the companion of Paul, who is composing the gospel; his is the choice of words to relate the revealed reality. Carol, Juniper B., O.F.M. “Mariology”, Milwaukee: The Bruce Publishing Co. 1955. O’Meara, Thomas A., O.P. “Mary in Protestant and Catholic Theology”, New York: Sheed and Ward, 1965. Cf. L Cerfaux, Gratia plena, in Mémories et Raports du Congrès Marial tenu à Bruxelles (1921), Vol. I (Bruxelles, 1922), pp. 34-40. H. W. Smyth, Greek Grammar [Harvard University Press, 1968], p. 108-109, sec 1852:b.